What the Huck? : Like it. Your New Year's Resolution. Like it. Your New Year's Resolution. Here's my January column for AVENUE magazine. Photography this month is by Annough Lykin. A new thing happened to me in November: someone posted a bad review of one of my books on Amazon. Not a badly written review, I should add, but a review that judged one of my books to be bad. ‘Junk’, I believe, was the word used. The reviewer described my plot as ridiculous, which isn’t at all an unfair comment because in certain respects it is. But then, James Bond films are ridiculous and we still enjoy them. 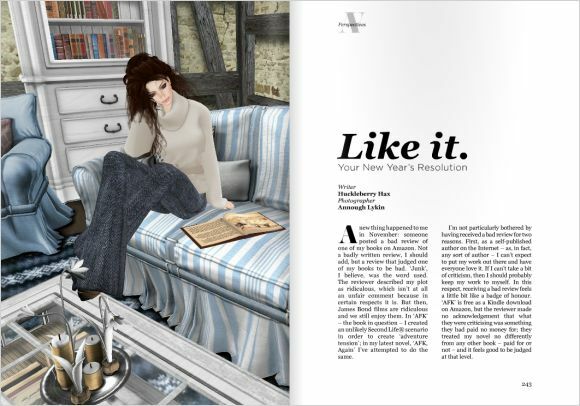 In ‘AFK’ – the book in question – I created an unlikely Second Life® scenario in order to create ‘adventure tension’; in my latest novel, ‘AFK, Again’ I’ve attempted to do the same. I’m not particularly bothered by having received a bad review for two reasons. First, as a self-published author on the Internet – as, in fact, any sort of author – I can’t expect to put my work out there and have everyone love it. If I can’t take a bit of criticism, then I should probably keep my work to myself. In this respect, receiving a bad review feels a little bit like a badge of honour. ‘AFK’ is free as a Kindle download on Amazon, but the reviewer made no acknowledgement that what they were criticising was something they had paid no money for; they treated my novel no differently from any other book – paid for or not – and it feels good to be judged at that level. Second – perhaps more importantly – this is the first and only (so far) piece of negative feedback I’ve ever had on ‘AFK’ in the five years of its publication. Every single other comment I’ve received has ranged from mildly positive to glowing. Fifteen people have left positive comments on my web site, three have done so on Amazon.com, four on Smashwords and I’ve received five positive reviews/ratings on Goodreads. In addition to this, the novel’s been positively reviewed by four other bloggers in their own blogs, including New World Notes. So that’s one bad review out of 32 published. Less than 5% – or, to express that another way – over a 95% approval rating. In addition to this, I must have received easily at least 20-30 IMs in SL from other readers about the book over the years, all positive. Enough people appear to like my book, then, that I can continue for now to believe it a worthwhile employment of the written word. There’s just one problem. Although I know that over 95% of the people who’ve read ‘AFK’ and left a review of some description have liked it, that fact isn’t going to be apparent to a visitor to Amazon.com, where now only three out of four – 75% – of the reviews are positive. That single bad review has dropped my approval by a whole 25% because, although ‘AFK’ has been downloaded over 1,600 times from Amazon.com over the last year, only four people so far have left a review. That’s just a quarter of 1% of all downloaders. The situation’s not much better on Smashwords, where four reviews have been left after 800 downloads: a half of 1%. When you’re an independent artist of any description – in other words, someone without a large advertising budget or a big name to guarantee you shop window space or above the fold positioning on popular websites – reviews, ratings and likes are probably the most important thing there is so far as the long-term credibility of your work is concerned. We all hope for the video or picture or excerpt of our work that will go viral and become next week’s Big Thing across the planet – this being the most publicised way that completely unknown people receive world-wide exposure – but the reality is that most such incidents occur with complete randomness; in any case, if your viral attempt doesn’t include a cat in some manner, then you can pretty much forget it (which reminds me, I really must dig out some of those old photos of the tortoiseshell I had when I was growing up and think up a witty, anthropomorphising caption to add as she looks into the camera). For the vast majority of us, then, the route to establishing ourselves in the new world market of digital products is in getting our work reviewed and appreciated. The political point of anything ‘indie’ is that it represents choice that isn’t available via the mainstream. There’s nothing inherently wrong with mainstream products, but it’s important to remember that these items – purchased in their millions – are selected for you by a very small and – arguably – non-representative group of people. This small group of people effectively get to decide on what you will see and hear and read. Indie offers you an alternative. Just as there’s nothing inherently bad about mainstream products, however, there’s nothing inherently good about independently produced ones. A self-published book could be brilliant, mediocre or – as my own unsatisfied reviewer declared – junk. The indie scene could be likened to a lucky dip in terms of quality – a vast, enormous, endless lucky dip as more and more people plunge into unregulated self-publishing of one sort or another – if it wasn’t for the fact that the same medium which enables individuals to make their work available also enables other people to give an indication as to whether it’s any good or not. The Internet is the medium which has liberated independent artists in terms of making their work accessible to an international audience; user feedback is the mediating mechanism which actually makes such a thing practical. But we have to use it for that to work. These days, the line between mainstream and independent products is becoming increasingly blurred. When it comes to writing, self-publishing is still regarded by many with disdain, even though the written word was the very first unit of creation to be liberated by the Internet. Few people experience similar reservations when it comes to downloading Apps for their smartphones, however, many of which are the products of small companies or individuals developing from their bedrooms. We don’t really care about the way in which an app was produced so long as we enjoy the end result and the ratings system is there to guide us in our purchase. But what we mustn’t forget is that the very variety that’s pushed as a selling point of smart phones – as immortalised by the slogan, “There’s an App for that” – exists precisely because this market makes no distinction between products developed by large companies and those by bedroom programmers. Right from the start, the two have been treated exactly the same and as a matter of necessity: just think how slowly the smartphone market would have developed if only large companies were able to bring software to it. 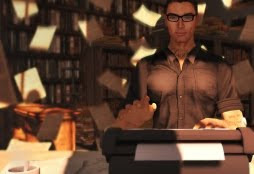 Second Life, of course, is utterly dependent on independently produced products; there is no ‘non-indie’ industry to speak of in the metaverse – everything we wear and use and live in has been designed by a resident. Even the large clothing labels are usually just a single designer and a small collection of staff. One of the reasons that I refuse to fall out of love with SL is its implementation of a modern-day digital cottage industry, one which I see as a model for a much wider industry across the entire Internet. When the web first achieved mass take-up in the late nineties, people used to talk about the liberation it offered artists of all descriptions from the big industries of recording and publishing. Unsigned musicians could get their work out to a larger audience. Artists could get create virtual galleries. And writers could find a following for their work. There was an unspoken understanding that the huge riches awarded to the fortunate few that made it through the funnel under the old system were unlikely to be found by an enlarged group of active creators, but an honest living was never considered out of the question. If only it were the case that consumers since then had started exploring the work of its lesser-known artists on a scale that changed the relationship society has with its culture; sadly, the main effect so far has just been to threaten the existence of big media through the illegal downloading of the very music and films they were pushing on us in the first place. Our imagination, so far, has failed us. But this isn’t an opportunity that’s about to expire on us and, in fairness, it takes a long time for old habits to be broken. Just like they said that the Internet would kill TV and it hasn’t, we still seek – despite all the technological advances – to encounter our culture through ‘trusted sources’. If we – the consumers – would really like to see this ultimately change, there are steps we can take right now about it. One of those steps is to buy indie products from time to time. Often, they’re more cheap than their mainstream equivalents. Sometimes – like ‘AFK’ – they’re free. So it’s hardly a great financial risk. But – and I cannot stress this highly enough – after you’ve read or listened to or viewed it and if you liked the thing that you obtained, leave a rating. On Amazon.com, you only have to leave a 20 word comment in addition to your stars and, if that’s really asking too much, you can just click on the ‘like’ button for that book instead. If you want independent producers to grow, do this to support them. If you’re a person who’s bought or downloaded things and not left feedback and are feeling now that my whining is nothing more than a guilt trip, I’ll come clean on something: I am just like you. I don’t think I’ve ever left feedback on anything I’ve ever bought from the SL Marketplace. The truth is, it took a negative comment on my book to make me realise my own lack of support for others. I will be doing something about this in 2013: my new year’s resolution is to leave feedback on things I enjoy as often as I can, even if it’s just a twenty word statement; even if it’s just to click a ‘like’ button. Well let me be the first to say hear, hear and thank you for another great article.